An active, healthy lifestyle is just steps away. World-class orthopaedic care right in your backyard. Whether recently injured or you have been suffering from a chronic condition for years, PRP therapy can restore mobility and eliminate pain. Our highly trained team of physical therapists help you return to activity quickly and safely with customized treatment plans. Stay up to date with the latest happenings at Impact Orthopaedics, from special events to new treatment options. When Impact Orthopaedics was founded in 2007, it was with my whole-hearted commitment to have a positive impact on everyone who came into contact with the practice. It was my goal for Impact to be a great place to work, and that within this healthy, helpful environment we would provide exceptional medical care and patient-centered service. With an outstanding support staff by my side, I feel confident this wish has been fulfilled. Ten years later, in an ever-changing medical landscape, I’m pleased to announce that I will be joining The Bone & Joint Surgery Clinic in September. Be assured that as my team and I move to this new location, our commitment to providing leading edge treatment and excellent patient care moves along with us. The Bone & Joint Surgery Clinic is one of the oldest and most respected practices in Raleigh, and this merger gives you access to multiple subspecialties not currently available at Impact Orthopaedics. Further, new, state-of-the-art x-ray and MRI services will be available onsite, offering you both convenience and reduced cost. I feel these factors will serve to enhance your patient experience even further. Please contact our office if you have any questions about the upcoming changes. I look forward to continued opportunities to offer my service and care to you in the years ahead. At Impact Orthopaedics in Raleigh, North Carolina, we specialize in orthopaedic care and physical therapy for active patients, from experienced athletes to weekend warriors. 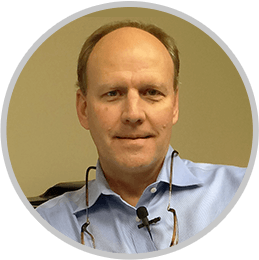 Dr. Robert Jones, an orthopaedic surgeon, commonly performs joint replacements, arthroscopy, and cutting-edge non­surgical treatments including dry needling and platelet-rich plasma (PRP) injections. He is one of the most experienced physicians at performing PRP therapy, having adapted this innovative treatment earlier than many others. Serving the Triangle and surrounding communities, we go beyond orthopaedics, taking a holistic and relational approach to provide complete healing so you can quickly return to your active lifestyle. Our physical therapists use a variety of techniques to treat patients including gait analysis, custom orthotics, and methodology from the Postural Restoration Institute (PRI). We offer on-site conveniences including casting and splints, as well as advanced imaging with X-ray and ultrasound. Looking for advanced orthopaedic and sports medicine care with a personal touch? Call us today at (919) 876-­6755, or request an appointment online. An athlete himself, orthopaedic surgeon Rob Jones, MD offers personalized orthopaedic care for fractures, traumatic and overuse sports injuries, and other common conditions. Utilizing cutting-edge diagnostic and treatment methods including arthroscopy, he has helped hundreds of patients return to play, work, and healthy living after an injury or disorder. "I had been suffering from a bad right hip for several months when I went to see Dr. Jones. He took x-rays and saw that I had a large bursa on my hip and some arthritic changes in my lower back. He gave me an injection of cortisone and suggested I see a physiatrist first for some rehab. After several visits to the physiatrist and several cortisone shots, my pain seemed to worsen. I had several rounds of physical therapy and decided I wanted to see Dr. Jones again. That's when he suggested that PRP injections might prove helpful. I had an MRI which revealed a small tear in my gluteus minimus. I've just had my third PRP injection and my pain is almost completely gone! I found the procedure relatively painless and the process fascinating to watch. Dr. Jones and his entire staff are beautiful people intent on making you feel better. They did that for me. I am now able to walk without pain and to work in my garden. Thank you, Dr. Jones." Dr. Robert Jones, an orthopaedic surgeon, commonly performs joint replacements, arthroscopy, and cutting-edge non­surgical treatments including dry needling and platelet-rich plasma (PRP) injections as well as Physical Therapy.